Kevin A. Williams (WAK) Limited Edition Signed Lithograph Ed. 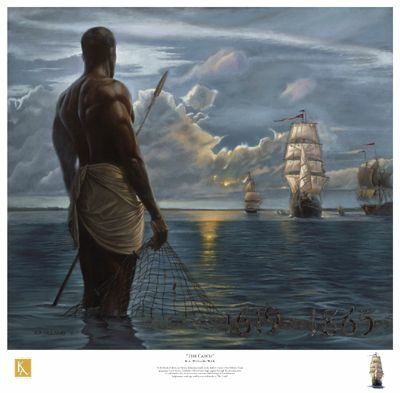 850:"The Catch"
About the Artist: Kevin A. Williams is an artist on a mission, but his is no solo trip: He wants to take you on the journey, too. His destination is a place where more African-Americans will appreciate, own and even create fine art that honors their rich heritage and hope filled destiny. So far, tens of thousands of people have willingly followed Williams to that vista - including talk-show host Oprah Winfrey, and actor comedian Bernie Mac. From celebrity homes to small businesses, corporate offices and women's spas, Williams' original and lithograph artwork hangs from coast to coast. As the best-selling artist in the African-American print market, Williams is a popular personality at national art shows, conferences of African-American groups and major international events, including the Essence Music Festival. His art has been featured on television's "Law & Order" (NBC) and "Soul Food" (Showtime). An artist who has received no formal training Williams' success has been in what some may call non-traditional methods of reaching art consumers.